Contents: Introduction: fashion and the practice of history: a political legacy, Beverly Lemire; Part I Fashion Practice in Early Modern Europe: Middlemen and the creation of a 'fashion revolution': the experience of Antwerp in the late 17th and 18th centuries, Ilja van Damme; Fabricating the domestic: the material culture of textiles and the social life of the home in early modern Europe, Giorgio Riello; Luxury, fashion and peasantry: the introduction of new commodities in rural Catalan, 1670-1790, Belén Moreno ClaverÃ­as. 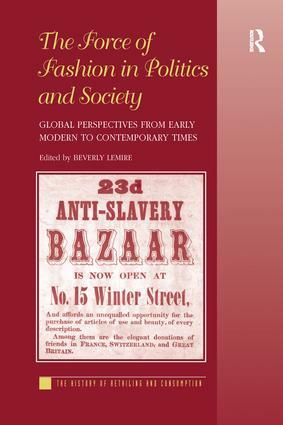 Part II The Politics and Practice of Fashion in the Long 19th Century: Fashion sprayed and displayed: the market for perfumery in 19th-century Paris, Eugénie Briot; 'Fashion has extended her influence to the cause of humanity': the transatlantic female economy of the Boston antislavery bazaar, Alice Taylor; Silk and sartorial politics in the Sokoto caliphate (Nigeria), 1804-1903, Colleen E. Kriger. Part III Fashion Strategies, Global Practice: Designing, producing and enacting nationalisms: contemporary Amerindian fashions in Canada, Cory Willmott; Reclaiming materials and fashion-work in the urban Philippines, B. Lynne Milgram; The city, clothing consumption, and the search for 'the latest' in colonial and postcolonial Zambia, Karen Tranberg Hansen; Bibliography; Index.